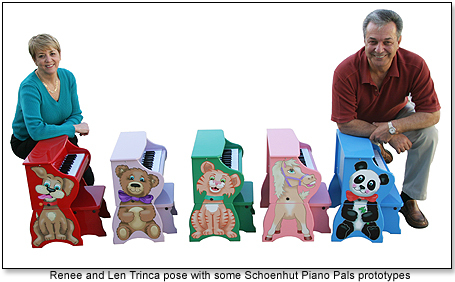 Strong relationships are at the root of success for Len and Renee Trinca, CEO and President of the 140-year-old Schoenhut Piano Company. From the day in 1996 when the couple fell in love ''at first sight'' with the company's products and took over as Schoenhut's owners, they have built friendships and support systems throughout manufacturing, retailing, consumer, and artistic circles. In addition, central to their business philosophy is a strong commitment to ''giving back'' by sharing musical instruments with children who would otherwise not be exposed to them. Specialty retailers are an integral component of Schoenhut's success. Perhaps because theirs is a family-owned business, the Trincas have a special place in their hearts for small mom-and-pop stores that give neighborhoods character and provide parents with a fun, safe place to take their kids shopping. “Fortunately, the demand continues for stores where customers can get advice from shop owners about the merits of various products. Another advantage is being able to take a child along to provide ideas on favorite selections for a gift," pointed out Renee. The Trincas are intimately involved in every facet of their business. 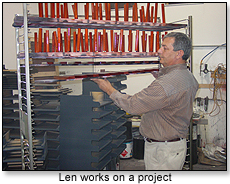 Of the new instruments offered each year to keep the product line fresh and exciting, most prototypes are designed and hand-built by Len. He then oversees manufacturing production to ensure the high standards and quality for which Schoenhut is known. ''Len has a very creative mind,'' Renee proudly told TDmonthly. ''He became infatuated with building things in junior high woodshop. After completing a project, he would proceed to make something even more creative than what the teacher had originally assigned." In addition to supporting local charitable activities, Schoenhut has partnered with TDmonthly for various giveaways across the nation. 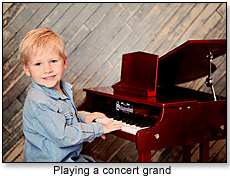 The first event in 2009 benefited ten charities, chosen by TDmonthly's Charitable Kid. The first of TDmonthly’s 2012: A Year of Charity promotions last spring provided donations to seven charities; the three specialty toy store owners who served as liaisons received valuable publicity during and after the event. Schoenhut also donated generously to the current 2012 giveaway, extending into the New Year. 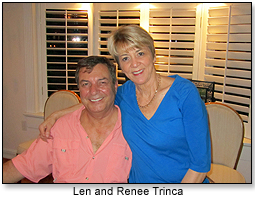 ''Len and I both had very generous parents who never hesitated to assist the less fortunate," states Renee. "That characteristic of helping people was ingrained into both of us. Our contributions result in a huge benefit, that of enormous satisfaction." Despite the recession, Schoenhut continues to flourish. Plans are complete to enlarge their facility in March 2013, doubling the size of its current space. "Len is especially happy, since a good-sized area is designated for his woodshop," commented Renee. And Len continues his ingenious designs. 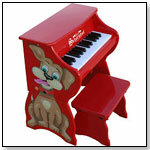 He is nearing completion of a toy piano prototype with a patent-pending soundboard. 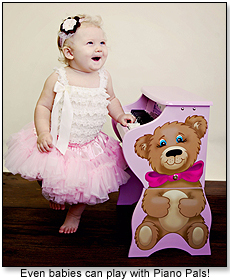 In addition to offering yet another innovative product to children, a marketing target will be the many professional musicians who use Schoenhut toy pianos for performing, teaching, conducting, and just plain fun. Schoenhut also continued its charitable giving straight into the new year. 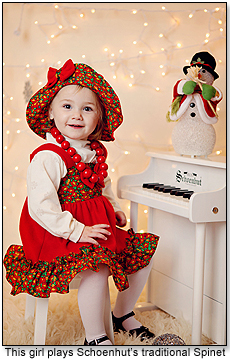 They signed up for the final TDmonthly’s 2012: A Year of Charity promotion, offering 100 pianos and other instruments to our two winning retailers, Figpickels Toy Emporium in Coeur D’Alene, Idaho (see article) and Children’s World in Sarasota, Florida. The generosity of Schoenhut and other donors resulted in so much local publicity that Figpickels had between 8000 and 10,000 people walk through their store during the holidays, and kept them busy from opening to closing, 7 days a week, for six weeks. “We’re still recovering!” said owner Brett Sommers gratefully. 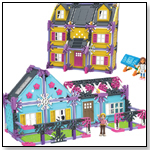 Toy Fair visitors are invited to stop by Schoenhut booth #2239. It is a great opportunity to view the wide array of traditional and new instruments, including toy pianos, acoustic and electric guitars, ukuleles, harps, drum sets, and more. A partner in music and good friend, the very talented Hannah Reimann, will be on board to play piano for four to five hours each day of the show. "We promise it be will fun!" says Renee in closing. Manufacturers: Follow Schoenhut’s lead and leverage your charitable giving to make your company stronger. Retailers: Find out how TDmonthly can increase your visibility in your community! 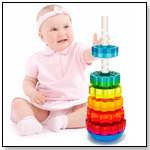 Email Alison@toydirectory.com. Little rock stars will take center stage playing Schoenhut's “next generation” guitar. Schoenhut's innovative design incorporating a molded composite body with dual curves greatly enhances sound and durability. The birch soundboard which offers excellent tone and resonance, hardwood neck (for rigidity), and molded composite fretboard ensure proper height and spacing of the frets. Six steel strings permit a wide range of rich sounds. Available in several vibrant designs. Includes: Pick and Extra String. Launch date: January 2012. · Contest: Will YOU Donate 100s of Educational Products to YOUR Local Schools?